There are hundreds of people that get new jobs just for interview experience, to try and test new interests, to develop relationships and connections with other people and for other odd personal reasons. Another experience that these people learn to do perfectly is to quit the job. Then there are millions of people that get new jobs simply for experience in the field so that they can move up in the occupational ranks (and monetary ranks). The experience that these people rarely learn how to perform perfectly is how to quit their job without saying why. This is where the wise words of the hundreds of people that make a frequent experience of getting a new job and quitting it, can be helpful. When moving from one job to another, it is never a paved, smooth and straight forward path. The majority of job transfers involve getting a new job before quitting the current one. Then it comes down to the recommended two weeks of notice that you have to suffer at the job you had just said you no longer want to do. It is this transition period that your character is most importantly judged since co-workers and your boss will be keeping an eye on you to see if you are still doing your job with effort. While there are dozens of reasons, both positive and negative, for switching jobs, when it comes down to the core of the job transition, very few want to explain why they are quitting. If you got handed $200 a day and the next day there was a second hand with $400 dollars in it for you to grab, you are not going to wait two weeks to start grabbing it are you? After all, your current boss should look at your quick leave with excitement both for you and for themselves. Not only has your boss been the one to watch you grow, but the fact you have succeeded at your current job is a likely reason you are going to another one and all the more reason that your boss should be happy that they were the contributing factor to your success. Now they have the chance to prove what makes them a great boss by hiring and training another super star at the workplace. At the end of this article, not only will you learn the best ways to leave your current job and how to leave your job without saying why, you will also come to find that giving a two week notice may not be necessary. When you go to quit your job, 75% of the time it is best to not say why. While many employers may expect you to explain, it’s beneficial to know that your boss has likely been in your same position and they will know not to prod you to explain why you are leaving. The majority of the time, they will already know why you are leaving and they only ask because they want a form of confirmation. Whether it is for good reasons such as being offered a job that pays higher, changing jobs so that you can provide more of your skills, or be more likely to advance up the totem pole or whether it is for more negative reasons such as being underpaid, having no room for advancement or there are co-worker and boss conflicts, it is perfectly admirable to quit without saying why. There are three ways you can notify your boss of your leave. By reviewing all three ways, you will be able to effectively communicate your departure without giving a reason because you will have a better insight of the situation and expectations. The Truth: The first way to quit your job is to simply tell the truth. While it can often take guts to give a specific explanation, this will lead you to have respect and to hold your integrity as you leave. This is the best choice if your situation matches the following variables. If you have been offered another job based on your skills at the current workplace. If you are moving or traveling. If your home, life or family will be changing such as having a baby or family complications that are affecting your work. The Partial Explanation: The second method is telling part of the truth. This will take some consideration before putting into action because you will want to create positive points to make with your boss while glossing over the real reason why you are leaving. In this situation, you have the opportunity to talk about what you have learned and give a general explanation rather than stating the real reason you are leaving. Telling a white lie may be the right thing to do if your situation matches the following examples. If you no longer enjoy your work. If you are going to another job to try something new. If you no longer see room for improvement or advancement. Without Saying Why: This final method of quitting your job is likely the reason you viewed this article. Unlike the other two methods, telling your boss that you are leaving the job without saying why can be used in all situations, both in a positive nature and in negative situations. 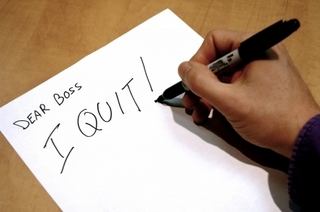 Telling your boss that you are quitting your job and not explaining why is – contrary to common belief -very easy. All you have to say is that you appreciate their time and the experience but you are leaving for personal reasons or that you are taking a different direction in your career. What resigning really comes to focus on is your confidence level. More often than naught, if you express that you are resigning for personal reasons with an unfettering amount of confidence, you will rarely ever be asked to explain your reasons. To help your confidence, it’s good to know that almost all bosses know that when you express that you are leaving for personal reasons, they will not go against the status quo and expectation of not asking what the reasons are. Accepting no reason for resignation is professional etiquette. While writing a resignation letter is the easiest way to quit your job without saying why, the best process to follow for quitting your job without saying why is the proceeding steps. By following these steps you will be certain that no bridges will be burned and that you will hold all the integrity and respect that you deserve after leaving which is what you miss out on when you write a letter. The first step and number one priority should be confidence. The first form of confidence is that you are sure that you want to quit your current job. Have you evaluated your reasoning even though you will not share why with your boss? Do you have another opportunity lined up? The second form of confidence comes from preparation. Have you planned what day you will submit your resignation? Will your boss be available? Immediately upon entering the office and meeting with your boss, begin to connect with them. You want them to open their life personality and show less of their work personality. You can do this by asking what their plans are for the weekend or if anything new and exciting has happened to them recently. Announcing your resignation should not be a problem if you have properly built up your confidence and have already made a social connection with your boss. Clearly state that you are leaving due to personal reasons or even more simply, only state that you will be resigning on a specific date. If they muster up the courage to ask you why, then you can say for reasons that you do not feel comfortable sharing. Without a doubt they will not try to know more. After announcing your resignation you want to provide creative and positive feedback to your boss and the company in general. Use a specific example that you are happy you learned with your experience working there. This is also an opportune moment to direct your boss’s attention at another co-worker that you believe could very well handle your position. For those who feel that you will be prodded to explain your reasons for leaving from co-workers and your boss during the two weeks of work after putting in your notice, you have two options. The first is to let the day you announce your resignation, be your last day. Leaving your current job is much like the experience of being fired, which can be done immediately and without notice. The second option is to maintain your confidence. When it comes down to it, people just want to quit their jobs in good standing and you can do this if you keep your confidence and express your gratitude and when asked why you are leaving, respond with “It’s time to move on.” And it is.